I'm going through my classes looking for bread recipes. Polenta pizza dough was next up. The original recipe was for smoked or roasted eggplant, goat cheese, and sun-dried tomato pizza. I don't love eggplant on pizza, so I traded it out for artichoke hearts and olives. In the bowl of a stand mixer with dough hook attachment, put the semolina, flour, polenta, salt, olive oil, and yeast. Combine a bit. Dissolve the barley syrup in the warm water. Note this will cool the water down so start with it slightly over 130°F. Make sure it is between 120°-130°F before you add it to the flour mixture. Add it to the flour mixture. Combine well. Knead the dough until it is smooth. I do some of this in the mixer and some out of the mixer. Add a little flour, if needed when kneading by hand. Place the dough in a lightly oiled bowl, cover, and allow to rise until it has doubled in size, about 2 hours. Put pizza stone in the oven. Preheat the oven to 425°. Roll out the dough to a large circle. Prepare pizza peel with a some semolina. Transfer the dough to the pizza peel. Brush with reserved tomato oil. 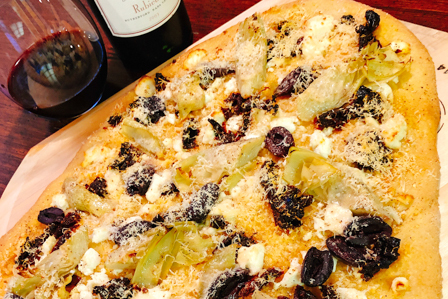 Top with garlic, artichoke hearts, olives, goat cheese, and sun-dried tomatoes. Season to taste with salt and pepper. Sprinkle with Parmigiano Reggiano. Slide the pizza onto the pizza stone in the oven, and bake for 20 to 25 minutes. When done baking, using pizza peel to get pizza out of the oven. Allow pizza to cool on rack for 5 minutes before cutting.